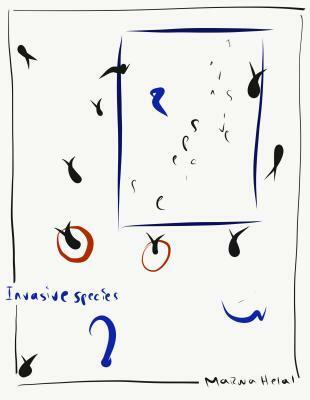 In Invasive species, Marwa Helal's searing politically charged poems touch on our collective humanity and build new pathways for empathy, etching themselves into memory. This work centers on urgent themes in our cultural landscape, creating space for unseen victims of discriminatory foreign (read: immigration) policy: migrants, refugees--the displaced. Helal transfers live In Invasive species, Marwa Helal's searing politically charged poems touch on our collective humanity and build new pathways for empathy, etching themselves into memory. This work centers on urgent themes in our cultural landscape, creating space for unseen victims of discriminatory foreign (read: immigration) policy: migrants, refugees--the displaced. Helal transfers lived experiences of dislocation and relocation onto the reader by obscuring borders through language.